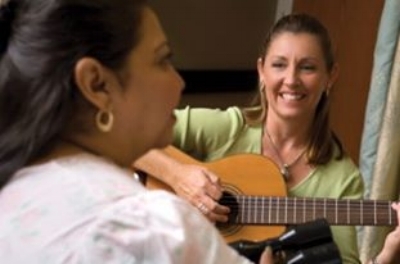 Expressive Healthcare Solutions is an established music therapy provider, serving healthcare needs. We provide services to hospital systems, small healthcare providers, and private clients in the Chicago Suburbs. We stand behind our Board Certified Music Therapists (MT-BC’s), who possess exceptional clinical skills, understand how to increase functional outcomes, and are passionate about improving the quality of life for our patients. EHS is best known for our work with; hospitals, rehabilitation groups, senior care facilities, hospice, and mental health programs. For community and corporate groups we also offer wellness programming. If you are looking for outstanding Music Therapy programs to serve your facility, or are just interested in hiring a Music Therapist, let us know. We are here to serve you!